Let’s face it, art can be a confusing thing. And, if you’re new to making art – then it can be difficult to tell which kind of art you should make. 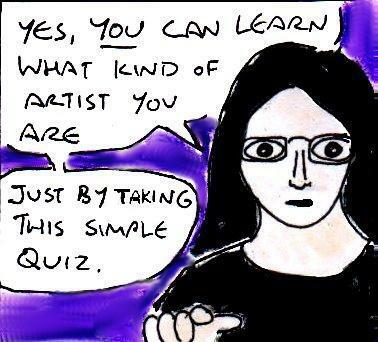 So, I thought that I’d start this month’s trove of articles with a handy quiz that will help you work out which kind of artist you are. So, get a pen and paper handy – and let’s get started! Question One: There is something lurking in the shadows, what is it? B) Three boxes of tennis balls and a pair of old trainers. They’re surprisingly expensive. C) A filthy hippie! See! It’s even written on his T-shirt! D) A puddle of vomit. But you already knew that, didn’t you? E) An unusually rotund cat, who is wearing a three-piece suit and smoking a cigar. F) You didn’t use black paint for those shadows, did you? Real artists don’t use black paint for anything. Ever. G) I don’t know, it probably isn’t a good idea to look. H) The hotel staff, trying to retrieve the smashed remains of a television. Question Two: You’re putting on an exhibition, where do you do it? A) London, because that’s where the rich people are. B) London, because that’s where the rich people are. C) An old manor house in the countryside. With a bouncer on the door to keep the riff-raff out. D) Magaluf, Ibiza or Faliraki. Or any British high street after midnight. E) Nowhere. Don’t you know how bad travelling is for the environment? H) All over! I’m on a world tour, baby! B) An uncultured, reactionary philistine! D) Winning at beer pong. G) More interested in the cute guy on the next table. H) Interested in a long-term relationship! Question Four: After your disastrous date, you decide to order a drink. What do you order? B) Something that even the bartender hasn’t heard of before. C) A glass of whisky, after spending ten minutes telling a boring story to the bartender. E) Nothing. You’ve already drunk more than the Government’s recommended consumption limits. F) A glass of wine. G) Whatever you’ve been drinking earlier. H) What do you mean I have to pay for it? Do you know who I am? Question Five: Someone criticises your art, how do you react? A) You refine your sales pitch and hope for better luck next time. B) You rewrite your artist’s statement and hope for better luck next time. D) You ignore them and keep drawing badly-drawn penises on their forehead in marker pen, whilst laughing loudly. E) You sternly tell your critics to check their privilege! And then write an outspoken Tumblr post about them. F) You let out a derisive snort of indignation and walk away. G) You react with puzzled incomprehension. H) You get to reply in an editorial column in a major newspaper. Question Six: You’re listening to some music, what are you listening to? B) Why should I tell you? You’ve probably never even heard of them. C) Something from the seventies …or earlier. D) I dunno, but it’s easy to dance to. E) Nothing. All music is offensive … to someone, somewhere. G) The same bands you listened to when you were a teenager. H) The support band. They aren’t as good as I am. If you answered mostly “A”: You Are A Con Artist– You enjoy tricks, scams and grifting. You don’t actually need to make any art – you just have to make sure that people think that the stuff you’re selling is art. Your clients are, inevitably, people with far more money than sense. If you answered mostly “B”: You Are A Conceptual Artist– See above. If you answered mostly “C”: You Are A Conservative Political Cartoonist– Your art may be badly-drawn and you may have to write explanatatory text on everything in your cartoons because your readers are not sufficiently evolved enough to understand basic symbolism, but that doesn’t matter. After all, you went to the same private school as the editor did – and those other cartoonists didn’t! If you answered mostly “D”: You Are A Piss Artist– … and you’re taking the wrong quiz! I’ll tell you what, why don’t you turn this into a drinking game and take a shot every time the word “Question” appears? If you answered mostly “E”: You Are A Liberal Political Cartoonist – Yes, you’re the kind of bold, free-thinking cartoonist who loves nothing more than “sticking it to the man” on a regular basis. Just as long as you don’t offend him. Or anyone else for that matter. Because that would be bad. If you answered mostly “F”: You Are A Traditional Watercolour Painter– Yes, and a very traditional one at that! If you answered mostly “G”: You Are Not An Artist– There’s hope for you yet! Get out while you still can! If you answered mostly “H”: You Are A Musician– Goddamn it! Why do you people keep calling yourselves “artists”? You’re musicians! 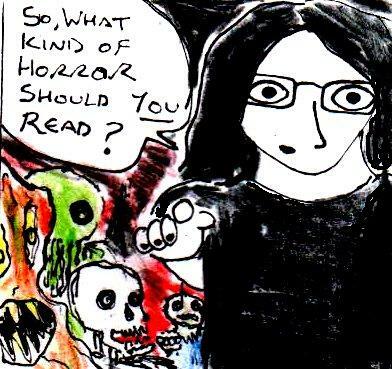 Multiple Choice: What’s Your Favourite Type Of Horror Fiction? Horror fiction is, quite frankly, one of the coolest genres of fiction. But, if you’re new to this genre, the wide variety of different types of horror stories out there can be confusing. Well, fear not! Here’s a handy quiz which will help you to work out which type of horror fiction you will enjoy the most and which authors you should read. So, get a pen and paper and let’s begin…. Question One: There is something in the shadows, what is it? A) A cosmic horror from beyond time and space that can drive even men of science to the depths of insanity. B) A horde of giant flesh-eating rats. C) An unquiet spirit, roused from it’s grave to haunt the living. D) The distinctive amber glow of the end of a clove cigarette. F) An unquiet spirit, roused from it’s grave to eat the living. G) A human, infected with a rabies-like virus. H) An evil clown, hiding in the drains. I) An indescribable, yet sentient, mass of living tissue. Question Two: You’re going on holiday, where do you go? A) The mountains of Antarctica, to investigate some mysterious caves. C) A charming old rural mansion. D) A graveyard, because holidays are for posers. E) Nowhere, because you’re in high school. A crappy high school. F) A cabin in the woods, near a graveyard. G) Any major world city. But, almost inevitably, somewhere in America. H) Maine. Anywhere in Maine. I) Holiday? I’m too busy in the lab to take a holiday! A) A strange woman called Aesnith, who doesn’t seem to be quite herself. B) A nymphomaniac or a serial killer. Or both. C) From a prestigious family with a troubled past. D) A very cute guy who wears lots of eyeliner and reads poetry to you. F) A woman called Barbara. They’re coming to get her…..
G) Infected with that horrible new virus that you saw on the news recently. H) Totally ordinary. What did you expect? I) Growing an extra pair of arms. Question Four: You are about to die, how do you die? A) Nobody knows. All that is left is a mysterious account of your last moments. B) In an inventively gruesome fashion. D) By meeting an oddly cheerful woman dressed in black, she’s wearing an ankh necklace too. E) You don’t. There is nothing but eternal suffering.. Sorry, I mean marital bliss…..
F) Your brain is eaten. But, hey, life goes on…. G) Your brain is eaten. Because, well, some things never get old…. H) Violently, but not too gruesomely. Question Five: You are walking through the desert and you see a tortoise. You turn the tortoise on it’s back, it’s belly baking in the hot desert sun. Why did you do this? Why did you do this, Leon? …Ooops! Wrong quiz! Don’t worry, it’s just a test. In fact, I have the questions written down right in front of me…..
A) A gramophone record of mysterious incantations. D) Something dark, ambient and nihilistic. E) The greatest hits of Justin Bieber. F) Seventies pop music or maybe something from the swinging sixties? G) Something dark, ambient and nihilistic. I) Something modern. With synthesisers. If you answered mostly “A”:Lovecraftian Horror – You enjoy melodramatic tales of science gone awry, malevolent occult forces and cosmic terrors beyond human understanding. You should read anything that has been written by H.P.Lovecraft. If you answered mostly “B”: Splatterpunk Horror – You enjoy visceral and unflinching horror stories which make the “Saw” movies look ridiculously tame by comparison. You should read anything written in the 1980s by Shaun Hutson, James Herbert and Clive Barker. If you answered mostly “C”: Ghost Stories – The classics are the best, eh? You should read anything by M.R.James, I guess. If you want something a bit more modern (and scary), then check out “Heart-Shaped Box” by Joe Hill. If you answered mostly “D”: Gothic Fiction – You enjoy atmospheric, and occasionally vaguely vampiric, tales about death and nihilism. You should read “Lost Souls” and “Drawing Blood” by Poppy Z. Brite. You should also try to read “Interview With The Vampire” by Anne Rice, but you can watch the film adaptation instead…. If you answered mostly “F”: Old Zombie Horror – You enjoy zombie stories featuring good old fashioned slow-moving, groaning, brain-eating zombies. You should read “Viking Dead” by Toby Venables, “Double Dead” by Chuck Wendig and “The Umbrella Conspiracy” by S. D. Perry. If you answered mostly “G”: New Zombie Horror – Slow zombies are boring. And, anyway, if the world is going to be overrun with zombies – then they’re at least going to be able to run. Maybe I’m not that well-read, but this type of zombie tends to turn up in movies and videogames a lot more than it does in novels. If you answered mostly “H”: Stephen King – Well, he has his own shelf in quite a few large bookshops, so he should have his own entry in this quiz. You’ve got no shortage of books to read here….. If you answered mostly “I”: Body Horror – You enjoy darkly surreal tales of malleable flesh and strange,unnatural creatures. You should check out “The Hellbound Heart” By Clive Barker, “Parasite Eve” by Hideaki and Sena, “Dead Space: Martyr” By B.K.Evenson and pretty much any film made in the 1980s and 90s by David Cronenburg. Anyway, I hope that you enjoyed the quiz, I’m not sure if this will be a regular feature or not…..